﻿ Acts 17:31 because He has fixed a day in which He will judge the world in righteousness through a Man whom He has appointed, having furnished proof to all men by raising Him from the dead." 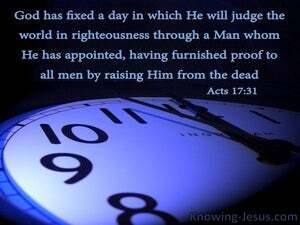 because He has set a day on which He is going to judge the world in righteousness by the Man He has appointed. He has provided proof of this to everyone by raising Him from the dead." because he has set a day when he is going to judge the world with justice through a man whom he has appointed. He has given proof of this to everyone by raising him from the dead." Because he appointed a day during which he is going to judge the world in righteousness by a man whom he appointed, having provided assurance to all men because he raised him from the dead. 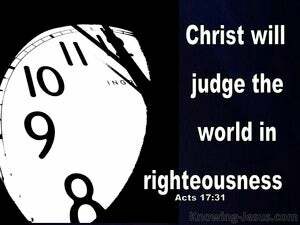 For He has appointed a [certain] day when He will judge the people of the world according to [a standard of] true justice by the man [i.e., Jesus] whom He has appointed [as Judge, See II Tim. 4:8]. [And] He has given assurance to all people [that He will do this] by raising Jesus from the dead." because he has appointed a day in which he will judge the world, in righteousness, by the man whom he has chosen, giving to all assurance of this, by having raised him from the dead. Because a day has been fixed in which all the world will be judged in righteousness by the man who has been marked out by him for this work; of which he has given a sign to all men by giving him back from the dead. because he has fixed a day on which he will judge the world in righteousness by a man whom he has appointed, and of this he has given proof to all men by raising him from the dead." because he has fix'd the day, when he will judge in equity, by that man, whom he has appointed thereto: of which he has given full proof to all the world, by having raised him from the dead." because he has set a day in which he is going to judge the habitable earth in righteousness by the man whom he has appointed, giving the proof of it to all in having raised him from among the dead. as He has appointed a day, in which he is about to judge the world in righteousness by the man whom he has ordained; giving faith to all, having raised Him from the dead. since he has fixed a day on which he will justly judge the world through a man whom he has appointed, and whom he has guaranteed to all men by raising him from the dead." Because he hath appointed a day, in which he will judge the world righteously, by the man whom he hath ordained, whereof he hath given assurance to all men, in that he hath raised him from the dead. Wherefore he set a day, in which he is about to judge the habitable globe in justice by the man whom he appointed; having offered faith to all, having raised him from the dead. Because he has appointed a day, in which he will judge the world in righteousness by that man whom he has ordained; and of this he has given assurance unto all men, in that he has raised him from the dead. because he has set a day on which he is going to judge the world in righteousness by the man who he has appointed, having provided proof to everyone [by] raising him from the dead." because He has appointed a day in which He is going to judge the world in righteousness by a Man whom He appointed, having given proof to all by raising Him from the dead. because he hath appointed a day, in the which he will judge the world according to righteousness, by that man, whom he hath appointed, and hath offered faith to all men, after that he had raised him from death." inasmuch as he has fixed a day on which he will judge the world justly by a man whom he has destined for this. And he has given proof of this to all by raising him from the dead." inasmuch as he has fixed a day in which he will judge the world justly, by the Man whom he has ordained, and he has given proof of all this by raising him from the dead." because he has set a day on which he is going to judge the world in righteousness, by a man whom he designated, having provided proof to everyone by raising him from the dead." because he has appointed a day in which he will judge the world in righteousness by the man whom he has ordained; of which he has given assurance to all men, in that he has raised him from the dead." inasmuch as he hath fixed a day, in which he will judge the world in righteousness by a man whom he hath appointed; having given assurance to all by raising him from the dead. because he has appointed a day in which he is about to judge the world in righteousness, by the man whom he has appointed, giving assurance to all by raising him from the dead. inasmuch as he hath appointed a day, in which he is about to be judging the habitable earth in righteousness, by a man whom he hath pointed out, - offering faith unto all, by raising him from among the dead? because he hath fixed the day in which he will judge the whole world in righteousness by the man whom he hath appointed; affording evidence of this to all, by raising him from the dead. Because he has fixed a day on which he intends to 'judge the world with justice,' by a man whom he has appointed--and of this he has given all men a pledge by raising this man from the dead." Because he hath appointed a day, in which he will judge the world in righteousness, by that man whom he hath ordained: of which he hath given assurance to all men, in that he hath raised him from the dead. seeing that He has appointed a day on which, before long, He will judge the world in righteousness, through the instrumentality of a man whom He has pre-destined to this work, and has made the fact certain to every one by raising Him from the dead." 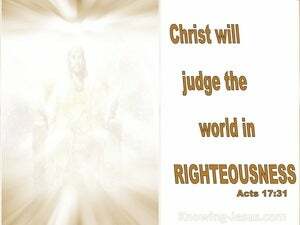 since He has set a day on which He will justly judge the world through a man whom He has appointed. He has made this credible to all by raising Him from the dead." inasmuch as He appointed a day in which He intendeth to judge the inhabited earth in righteousness, by a Man Whom He appointed, having given assurance to all by raising Him from the dead." Because He hath fixed a day, in which He will judge the world in righteousness, by that man whom He hath appointed thereto; having given assurance of it to all men, by raising Him from the dead. 30 "Therefore having overlooked the times of ignorance, God is now declaring to men that all people everywhere should repent, 31 because He has fixed a day in which He will judge the world in righteousness through a Man whom He has appointed, having furnished proof to all men by raising Him from the dead." 32 Now when they heard of the resurrection of the dead, some began to sneer, but others said, "We shall hear you again concerning this." "The God of our fathers raised up Jesus, whom you had put to death by hanging Him on a cross.